Pune-based 32-year-old Sucheta Kadethankar covered a distance of over 1600 km in 51 days to become the first Indian to cross the Gobi desert in Mongolia. This is her story. 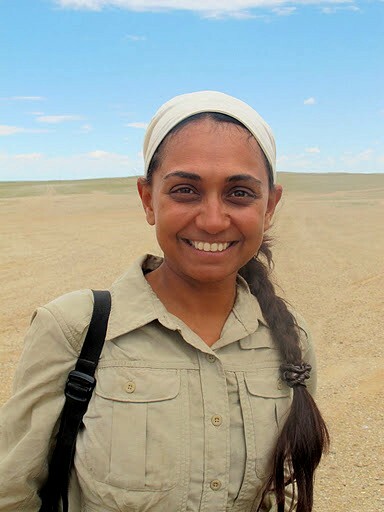 At around 11.40 am when the sun was at its peak on July 15 this year, Sucheta Kadethankar became the first Indian to have crossed the Gobi desert. The 32-year-old was part of an expedition that had attempted to walk across the desert, a distance of 1626 km, over a span of 60 days. 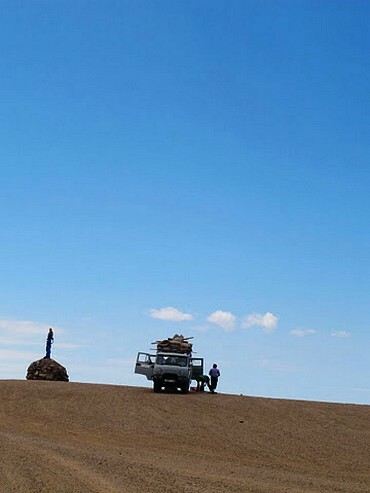 When the expedition started out from the Bulgan province on May 26, it was 13-person strong. By the time they completed their journey, nine days before schedule about 5km before the town of Sainshand, there were just seven of them left -- six others dropped out, mostly because of injuries. The anti-climactic feeling had a long story behind it, one that took about 51 days to unfold. 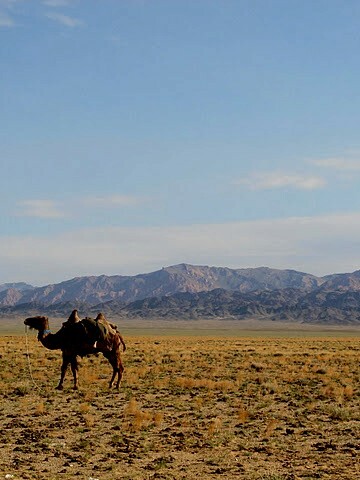 In November last year, I heard of globetrooper.com and responded to an invite for an expedition across the Gobi Desert in Mongolia. I have been into endurance sports for a while now. I've trekked to the Mount Everest Base Camp in 2008 and have cycled from Manali to Leh in 2006. Besides that I have (literally) done hundreds of treks in the Sahyadris. Sinhagad, the fort near Pune that is also a favourite trekking spot, is practically my backyard. I trek there every Thursday and Sunday. By now I know practically every single stone there! 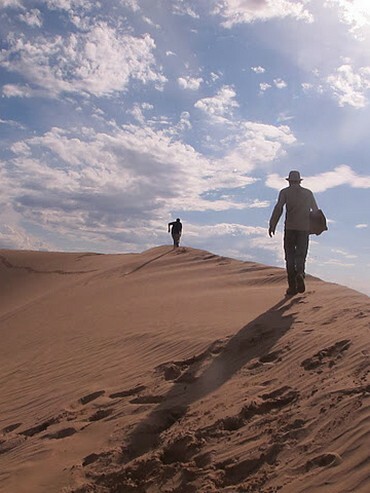 The Gobi expedition caught my interest simply because I had never trekked in a desert terrain and I wanted to experience the extreme environment. So I signed up and after a round of screening process, I got in. 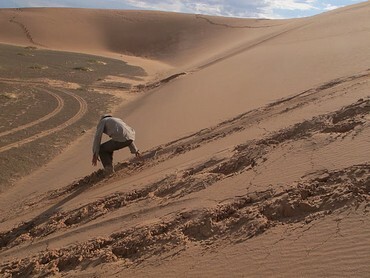 Ripley Davenport, a well-known desert explorer was organising this expedition. Although he had cross Gobi solo last year, this was the first time he was attempting it with a group in tow. We were 13 trekkers from 9 countries who met for the first time in Ulaanbaatar, the capital of Mongolia, where we spent a few days and got to know each other before we would embark on the journey of our lives. It was like Bigg Boss -- living with people you don't know for three months! The only good part I suppose was that you didn't get voted out! Anyway, so after spending a few days together, we flew to Khovd, which is one of the western provinces of the country. From Khovd, we were driven by three vans to Bulgan from where we would start walking east. The difference between a desert expedition and a usual trek is that there is nothing rewarding that the nature has to offer. When you trek to, let's say in the Himalayas, you know you will most certainly be looking at a rare landscape that very few people get the opportunity to see. This isn't the case in a desert trail. The landscape is the same -- arid, dry and wasted -- and the temperatures are extreme. Half your encouragement is gone right there! One of the biggest challenges in such expeditions is to keep one's motivational levels really high. One has to have single-minded focus on completing the trail come what may. The first 15 days of the expedition were really tough. There were a lot of injuries and the body was still getting used to the extremes of the weather -- during day temperatures used to go to as high as 45 degrees and in the nights they used to dip to less than 5. Many of us caught the flu. Others had really bad blisters. And in the case of some, these blisters were threatening to turn into gangrene. So these people had no option but to quit and return. One of them, a contestant from the Netherlands quit because he lost all interest and motivation to go on. Initially it was extremely demotivating to see your teammates dropping out. It doesn't help the rest of the team that is trying to complete the task but at some point one has to be able to look beyond this and focus on your final objective. I too suffered from blisters and there were times I was dying to quit. But thankfully the will to go on would always win over the temptation to give up. During my trip I was carrying a few audio books that I hoped would inspire me when I was down. It was during one such moment that I came across that great line from Lance Armstrong's autobiography: Pain is temporary; quitting lasts for ever. And that was when I decided that I would never, ever let the thought of quitting cross my mind. But there would be a particular incident that would almost put me out of action. In the initial days, it was really difficult for me to contain my hunger for food. We used to have five barrels of water of 60 litres each that would last us for about 4-5 days after which we would have to start looking to refill them and the cycle would continue. The routine we followed was to wake up in the morning, leave the camp and start walking eastwards. Back at the camp there would be a team that would cook food for us and would follow us in a multi-terrain vehicle to deliver the lunch to us and later would go on to a pre-decided spot where we would camp for the night. This of course is easier said than done. In the desert where there are no landmarks and the only thing you can depend upon are a GPS and a map, it isn't very difficult to get lost. You change the bearing by even one degree and start walking in the wrong direction you end up miles away from where you are supposed to be. So there were many occasions when the lunch would never arrive. Of course we couldn't keep waiting for the van, so we would keep walking till as late as 5pm by which time we would have set up camp and called it a day and hope that the van locate us. The initial days were therefore quite taxing. So I used to think of my favourite restaurant in Pune and tell myself 'Ok so this place is 11 km from my house so that is the distance I have to go'. And I would keep walking. In the first few days, I would try and imagine what the ideal day would look like -- as it was supposed to be: Have breakfast at 7am; load the camels; grab lunch and end the day. This was the scenario I would picture in my head. He told me: "You shouldn't imagine such scenarios at all. The mind is a complex thing and you must not give it multiple instructions. The only instruction you should give is 'walk east'. Don't even tell it that you have to walk till (let's say) 4pm. Make it simple. Whatever else you get on the way -- lunch, water, whatever -- will be a bonus." And that was that. It was the best advice I received and I came to realise what would be the greatest learning from these 51 days: after a point, however fit you are and whatever condition you are in, it is all in the mind. The other important takeaway from this was that even when you feel you have reached your limits, in reality you haven't. There were several occasions when I would spot our van from a distance and think that this was where we'd camp for the evening. But as we would get closer, the van would have moved on and there was some more distance to cover and then some more and so on till we reached a point where the camp site would actually arrive. That was when I would realise that hey, it was possible to walk that extra mile after all! It must have been the 19th or the 20th day of the expedition when I thought I'd almost not make it. 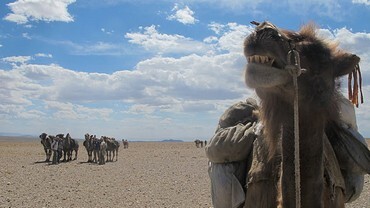 The 13 of us had 12 Bactrian camels on which we had loaded our luggage -- tents, sleeping bags etc. Before we started, we had been trained to handle camels. The 12 camels were split into trains of three or four camels per train. We would take turns in handling the camels so some of us would be able to walk without the camels at equal intervals. On this particular day, I was leading a train of three camels and the person ahead of me had another three. As it turned out, one camel from the last train had managed to run lose so the person handed me his camels and ran to rein in the one that was running lose. By this time I was quite comfortable with the animals and never expected anything untoward to happen. Except that it did. Suddenly, I found myself being kicked in my thighs from behind, flying almost a couple of feet in the air and landing on my left on the ground with a thud. For a good couple of minutes I had blacked out completely. When I regained consciousness my first instinct was to check if my legs were fine. The only way I would've had to give up was if I was absolutely unable to walk. I tried to move my legs. After a few anxious moments I realised that my legs were just fine. It was only after a few hours of walking it struck me that I had landed on my left shoulder so that was the part that was hurting the most. Since I had made up my mind to carry on, I let the pain be. The pain never went through the duration of the journey though it did get better towards the end. When I visited my doctor after returning to Pune where I live, he told me that my shoulder had dislocated and in the duration of the journey slipped back into place. I never could figure out which of the camels may have kicked me and after that incident I could never be friends with them! Time comes to a standstill in the desert. The sun rises as early as 5am and sets no earlier than 8pm. It seems sometimes that the day stretches as endlessly as the desert itself. There's no way you can guess the time unless you look at the watch. And the temptation to look at it is very, very strong. At the same time checking time over and over again can be very demotivating because you realise how far you are from the end of the day. A few days into the expedition, I had put my watch away. Towards the last few days, Sim Yihui from Singapore and I walked together and we would play this game where we'd decide to look at the watch only at a particular time and all along we would try to guess what time it would be. And when we would both agree that it might just be time to look at the watch we would pull it out. Sometimes we were wrong and we'd feel miserable but at other times we were right and we'd be jubilant! Sometimes when nothing else would work we would count our steps just to keep our minds engaged. Then there were those few days when a rare phenomenon would occur -- it would rain! The Gobi desert falls in the rain shadow region so it doesn't usually rain here. But as it happened during our journey, it rained more than a few times along the way. The feeling was indescribable! The first showers were just two days into our journey, which after the initial excitement wore out made me a little depressed because I never knew when I'd get to experience it again. I wished it had rained later in our journey. And it did. After days of dry spells these showers would be bliss. They would come just out of the blue and we would just scream our hearts out. We hadn't bathed at all during this journey so something like this would, understandably, be exciting! Finally, we were almost at the end of our journey. It was, what we thought, the second last night before we reached our destination. Needless to say we were all very excited. The plan was to reach a particular oovoo (essentially a heap of stones that passers-by keep adding to. These offerings could range from a simple pebble to liquor or even a piece of clothing as a prayer for a safe passage) about 45 km away. This was supposed to be the point where the journey of over 1600 km would finally come to an end. The plan was to camp at the oovoo, celebrate and walk to the town of Sainshand about 5km away and travel back to Ulaanbaatar. So the next morning we began walking assuming that we would have a final long day ahead. A little before noon we saw an oovoo at the top of a hill and some of our teammates dancing around it. We had no idea what on earth was going on. Initially we thought we were breaking for lunch or calling it an early day perhaps. As we walked up to them we realised that we were mistaken. The oovoo that was supposed to be 45 km away was in fact just 22. And we had reached it. Just like that the long journey was over. Some of us including me felt cheated. We were looking forward to at least one more day before it would end but here it was -- the goal we were walking towards for all these days right there standing before us! It took a few hours before the reality sank in and we celebrated the end of this momentous journey before heading to our respective homelands. Sometimes, what we are looking for isn't always that far. Sucheta Kadethankar's journey was sponsored in part by Symantec where in her non-superhero avatar she is a Principal Information Developer and friends who were kind enough to donate their savings to her among others. Here's how you can walk, shop and save energy!